We're happy to have Matthew Crow join us to talk about his latest novel THE BRILLIANT LIGHT OF AMBER SUNRISE. Matthew, what scene of THE BRILLIANT LIGHT OF AMBER SUNRISE was really hard for you to write and why, and is that the one of which you are most proud? Or is there another scene you particularly love? The epilogue, which is only about four or five pages long, is my favourite part of the book. I can’t talk too much about it, as it would spoil the entire story, but I feel as though anything I might have done well I did best in that passage. I wrote it in one go and it appears in print pretty much as it does in the first draft. I think I got the balance between humour and sentimentality just right, which is not always an act I can pull off! I don’t know if they made much of an impact in America, but to my mind the finest example of British Comic Writing is Sue Townsend’s Adrian Mole series. Almost every good thing in my life I can trace back to reading those books as a kid. Everything I can do as an author comes from attempting to capture just a fragment of how great Townsend was. She taught me that you can make a serious point without sacrificing humour or enjoyment, which was a real Ah-Ha! moment as a maudlin, pretentious teen writer. How long did you work on THE BRILLIANT LIGHT OF AMBER SUNRISE? About four months for a first draft- the quickest I’ve ever written a novel. Then about a year rewriting it with my editor. 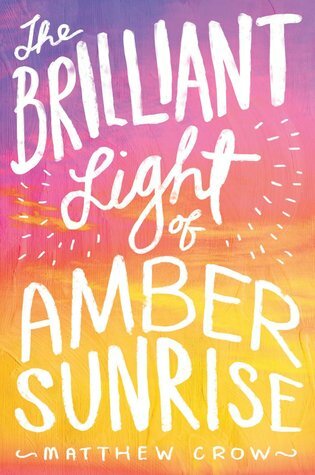 What do you hope readers will take away from THE BRILLIANT LIGHT OF AMBER SUNRISE? An urge to bulk-buy for friends and relatives? Or failing that a sense that love is strange and odd and never comes in quite the same shape for any two people. But learning to accept it in all its messy, uninvited glory is what makes the tough parts bearable and the long-run worth it. Do it because you love it. And treat any achievement as nothing more than a bonus. Also put more effort into Writing Books than into Being An Author. Two more books. One set in a sort of fictional version of the seaside town I grew up in. I’ll be finished with that in a couple of months time. The second book is, again, YA. It’s just notes at the moment but I’m especially excited for this one. I think I’ll start it in the summer and if all goes to plan will be finished the first draft by the end of the year. Matthew Crow was born in 1987 and raised in Newcastle, UK. Having worked as a freelance journalist since his teens he has contributed to a number of publications including the Independent on Sunday and the Observer. He has written two novels for adults. The second, My Dearest Jonah, was nominated for the Dylan Thomas Prize.